The Barska Large Biometric Rifle Safe offers you more than enough space to store your firearms. With advanced biometric fingerprint technology you can access your guns within seconds. Without the need to remember a combination or finding a key. Securely storing your guns in this safe will have you prepared for any situation that arises. The Barska Large Biometric Rifle Safe safe is constructed from solid steel. While using a five-point, steel, dead bolt locking system to secure your rifles and other firearms. Additionally Barska provides a fingerprint system that stores and recognizes multiple users fingerprints to prevent unauthorized access. Up to 120 users can be loaded into the system. More than enough for everyone. Only those with registered fingerprints will be able to access the safe and the guns. With the programmable Silent Access Mode, you can quickly access your guns in emergency situations. In the rare event that the battery fails, two back-up keys are included for instant access. Not the largest safe in the world, but good for the average gun collection. The Barska Large Biometric Rifle Safe is also fairly light. 114 lbs is the weight. To counter this, Barska has put in 6, pre drilled anchor points for you to bolt the safe to the floor. For people with larger gun collections, this may not be the safe for you. This is a safe in which people with large collections would probably keep upstairs in the bedroom closet. Storing a few select guns in it. Or it is for people with small to average sized gun collections. What the big safes don’t offer is the Silent Access Mode, fingerprint technology and quick access ability of the Barska Large Biometric Rifle Safe. Long rifles of different gun manufacturers have been rumoured to not fit. For the most part, this is the buyer’s fault for this situation happening. Make sure you do proper measurements of your guns before purchasing a safe. It is important to remember that the shelves can be adjusted. They can also be removed to organise your safe while making room for larger firearms. Barska is known for its high quality customer service. 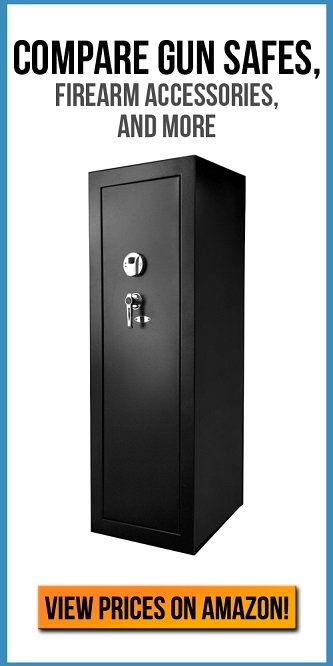 Any issues with their safes and you should immediately contact them. The safe also comes with a 1 Year Limited Warranty. With the most up to date technology, this safe offers the ultimate combination of security and accessibility in your home. The fingerprint technology alone at such a low price is worth the money. Barska is leading the way with affordable biometric technology. You would be making a great investment picking up the Barska Large Biometric Rifle Safe.